Several species of grasshoppers can cause foliar feeding damage in tobacco. They are typically most numerous in dry years and in fields adjacent to hay or weedy strips. Weed burndown or hay mowing can drive grasshoppers and other generalist insects into tobacco and increasing feeding activity. In general, weed control and haying should be avoided immediately before and for 4 weeks after transplant. No exact thresholds have been established for grasshoppers, but as a rule, treat when anticipated damage is equal to or greater than that caused by a 10 percent budworm infestation. 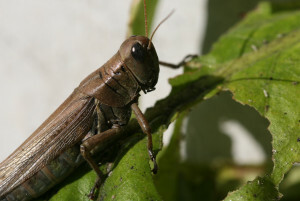 Grasshoppers are susceptible to broad spectrum insecticides. See the North Carolina Agricultural Chemicals Manual for registered materials, rates, and applications recommendations.